With Ooma Office, you are able to get high-quality business phone service in a variety of ways. If you currently don't have a hard-wired internet connection everywhere you need a business phone, no problem. Ooma Office can work with regular analog phones using the Ooma Linx, our wireless phone jack. 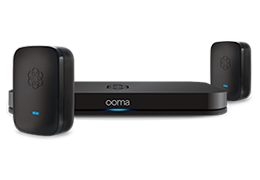 You can place the Ooma Linx anywhere there is an electrical outlet in your office (up to 150 feet from your Ooma Office Base Station) and get great call quality. Ooma Office can also work wirelessly through our SMB phone system mobile app. Simply download the app on your iOS (Apple) or Android device and use your smartphone with your business phone number. It's a cloud-based phone system that functions like a hardwired business phone - only it all works from your mobile phone. Now you can make and receive business calls from anywhere, as if you were in the office. How do I use the Ooma Office Mobile App to make business calls? How much can I save by switching to Ooma Office?